Let’s say a trader sells a Short Call with strike 100 (for making profit with the premium) at-the-money (for highest extrinsic value there). For hedging until expiration, he buys the underlying share at price 100. If the price goes up, ideally and theoretically, the profit from the share is equal to the loss from the Short Call. He adjusts his position of the share according to Delta. So in the first place, he buys a position of 0.5 at 100. This means, practically, that immediately above the strike, his shares make less profit than they should for hedging the full options position. However they will compensate by making already some profit below the strike. Yet this will be true only, if the price starts collecting the profit right from Delta=0 up to Delta=1. 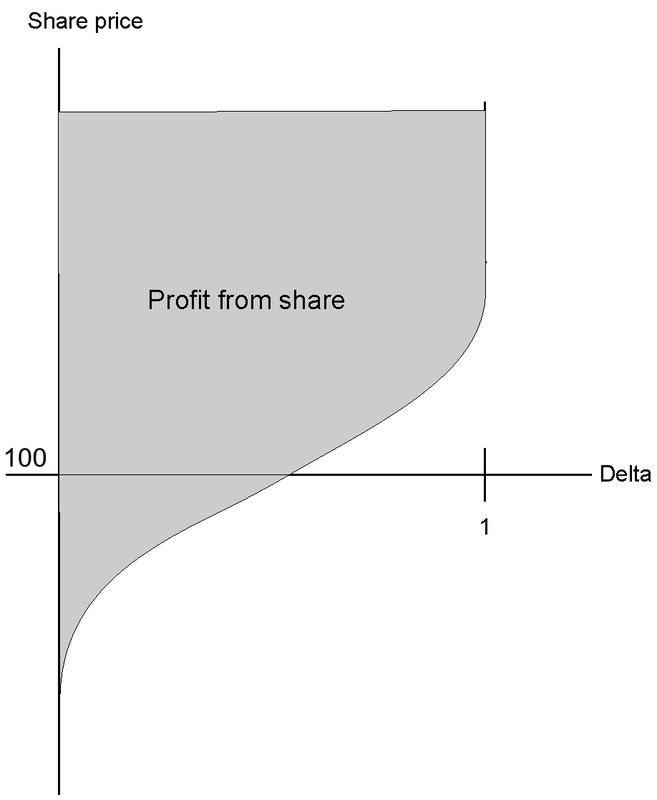 If he buys position 0.5 at the strike, and then the price only wanders around above the strike price, even though he is going to increase his position to Delta 1 eventually, the share will never earn the full profit it needs to fully compensate the short call loss (losses from the many small ups and downs not even considered yet). Would others see it the same way? And what to conclude from that? He could ignore Delta and always hedge with full position size (he is small enough and the market big enough for that). But if the price moves around the strike for long, and he has to fully go long above and fully flat below, his earned premium will be gone soon. Or he just has to bear this cost; it’s covered by the premium anyway. And most likely the price will go a bit underneath the strike anyway, and collect at least a bit of profit there. Or he would need to sell a Call not ATM but OTM, so he can start his hedge from where Delta is near 0. But doesn’t sound good either, as lower extrinsic value there. Browse other questions tagged options delta-hedging gamma or ask your own question.